In the fight of providing premium quality features and glamorous look Companies trying hard to launch devices that can compete with counterpart rivals. Here we are going with a Flagship device Huawei Mate 9 which is filling the gap that disconnection of Samsung Galaxy Note 7 left, Even after having mind-blowing qualities it also has some Advantages and disadvantages pointed in this post. the key specs of Handset are 5.9 inches FHD Display, Android v7.0 Nougat OS, Hisilicon Kirin 960 Processor, 12 MP Primary | 8 MP Secondary camera, 64 GB Internal | 256 GB SD Card Support, 4 GB RAM and 4000 mAh battery. This device is well designed with 2.5D Glass in front and metallic unibody design in back and corner. The edge of back surface is gently curved with the rounded corner for comfortable holding in hand. You will always feel owning a luxurious gadget to show off. To switch the phone and adjusting the volume loudness buttons are fixed on the right edge. Left edge housing SD/SIM card slot although Speaker Grille, USB Slot and 3.5mm audio jack is located on the bottom of the phone. Whenever we talk about the resolution of flagship phone everyone at least expecting 2K or 4K display in the smartphone nowadays. But Huawei here dropped the idea of providing the such a high resolution in this phone and stick to the Full HD 1080p resolutions, It is also true that all kind of material such as photos, videos or text is looking crisp and vibrant on the screen but such display is not ideal when you are looking for VR supporting handset. Surprisingly Huawei is able to maintain 77.5% screen-to-body ratio where they have kicked out unwanted bezel area so you will get a large screen without having a huge size gadget. In the department of camera phone has Dual primary 12+20 MP Camera, Where 12 MP sensor with RGB sensor are made for capturing colors, and a 20MP monochrome sensor for enhancing detail. The main improvement by this combination over Mate 8 is shown in night time shooting, where photos noise in reduced to the great extent by this technique of combining RGB+ Monochrome camera. To maintain better stability during shots phone also has OIS to help. The camera supports 4K recording which is offering quite decent quality. 8 MP secondary camera is quite good for people which are crazy for selfies, its wide angle lens covers more area to show and capture with pretty decent quality. It is a beast for gaming, anyone who loves to play a lot of heavy games in a big sized android device can opt for this gadget as its Kirin 960 CPU incorporated by the latest Mali-G71 MP8 GPU that offers great graphic experience without any frame drops. Switching between apps while operating multitasking is also butter smooth. Huawei loaded it their own interface EMUI 5 based on the Nougat v7.0 which is good upgradation over last EMUI 4 and many bugs are resolved in this update and finally ready to provide simple and smooth interface. We really appreciate the 4000 mAh battery inside the handset which is not going to drain quickly even after the heavy use. Using the internet Over 4G network with multiple apps all the days still there is some juice left in the battery. other attraction is SuperCharge technology safely charges the device for a full day’s power in 20 minutes as claimed by the Company. One of fastest android devices in performance. Good combination of Kirin 960 CPU + Mali-G71 MP8 GPU for intensive gaming. 4K videos are also very good and detailed. Dual primary camera setup for detailed photography. Charging speed is pretty fast can charge mobile within 1:0- 1:30 hours. Hybrid SIM Slot, you can't use SIM 2 with SD Card. Low Screen resolutions, only 1080p. 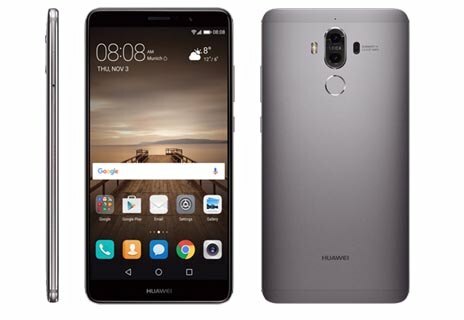 Are you interested in Smooth gaming Android phablet with a great premium built and quality features then definitely you can go for Huawei Mate 9, Offering an aesthetic ergonomical design along with the clean vivid camera, fast CPU and long lasting battery life. This is close competitor of Samsung Galaxy S7.